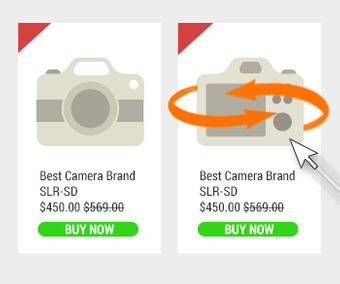 But what if you could show an additional view of each product before the visitor clicks its thumbnail? Even without any customization every Aabaco/Yahoo store already has the option to store and display an additional image for each product: a closeup, a lifestyle shot, a model, etc. You can do this by uploading an additional photo into the inset property. This photo will then show on the item detail page, but only there. 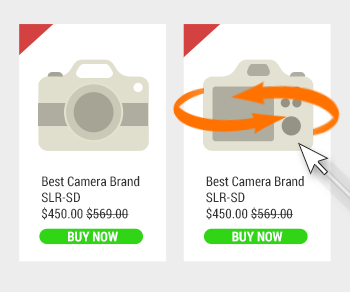 With our Rollover Thumbnails you can feature these secondary images right on the category pages. When the visitor hovers his or her mouse over the product thumbnail, if a secondary image is available, the primary image will fade into this secondary image. When the mouse leaves the thumbnail, the image fades back into the original (primary) image. Completely automatic, once this function is installed in your Aabaco/Yahoo Store all you have to do is upload your secondary shots into the inset property.